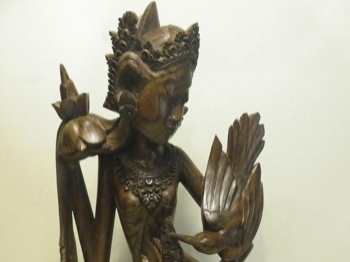 This graceful Dewi Sri was handcarved from black rosewood in the Mas Village of Bali, whose craftsmen are considered the finest wood carvers in the world. 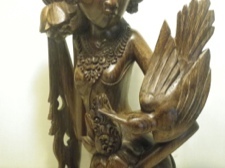 Black rosewood is highly appreciated for its deep hues of chocolate brown and distinct grain. 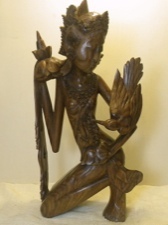 Deeply loved by the Balinese people, Dewi Sri is the goddess of rice and fertility. Rice is the most important food staple in the Balinese society. 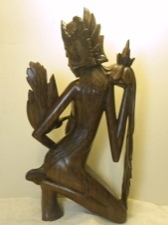 Dewi Sri is worshipped in many special places and one day of every month is dedicated to her. She 'feeds the people and sustains their lives.' 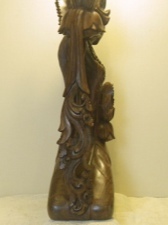 This special beauty stands 18 inches tall and 10 inches across.